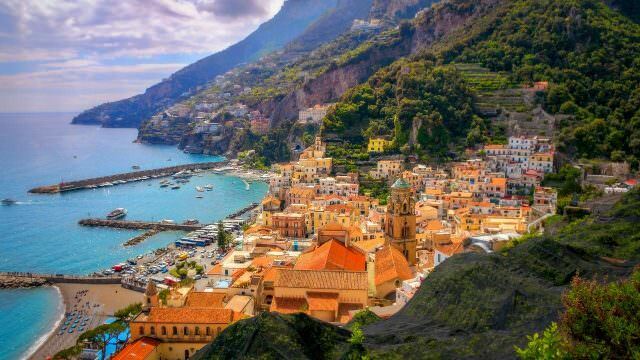 This 8-Day, 7-Night all-inclusive vacation offers a wonderful mixture of some of the Amalfi Coast's spectacular highlights along with some truly off-the-beaten-path treasures unique to the area. 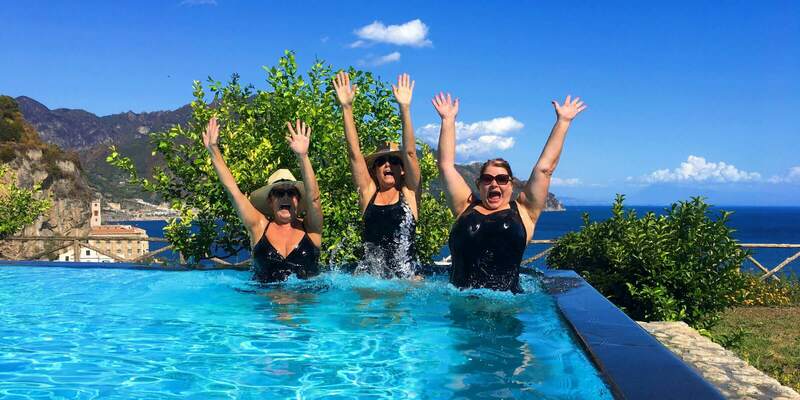 During this exciting vacation week, your small and intimate group will have the exclusive use of an historic villa perched in the hills above the dramatic and beautiful Amalfi Coast. 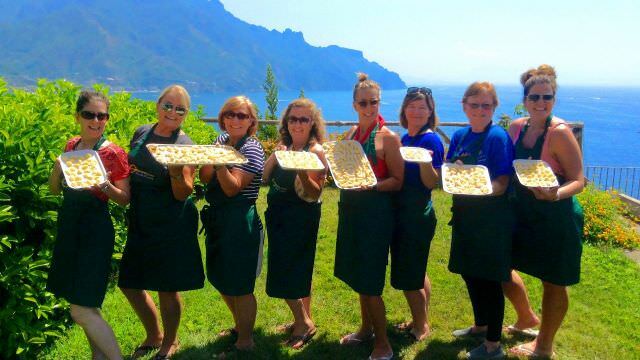 It is a vacation that embraces Southern Italian cooking, combining culinary and artistic tradition with some of the most wonderful locations along the Amalfi Coast and Naples area. 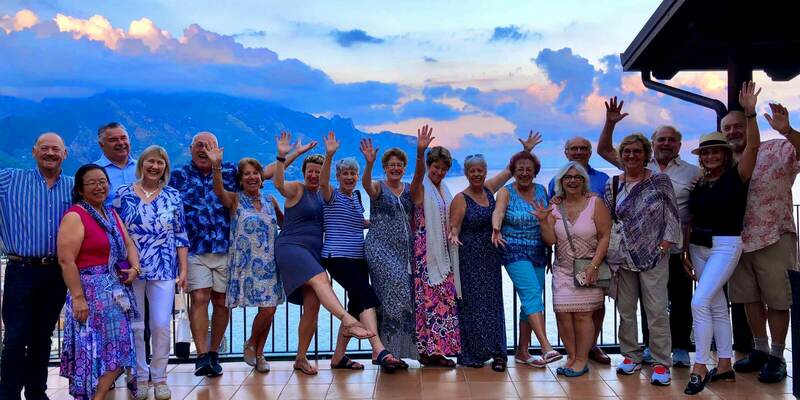 It is a week of discovery as you integrate into coastal Italian-village life, getting to know some of the locals, shopping with them as well as dancing and singing with them! 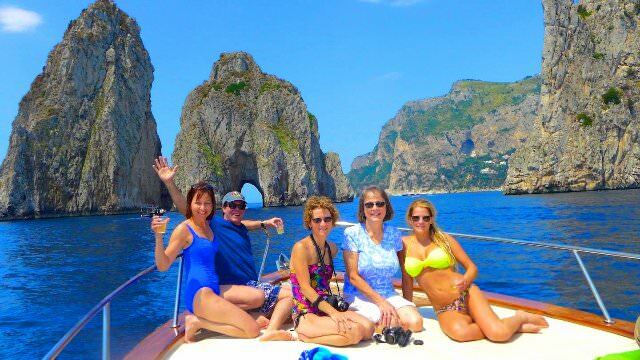 Most of all, it is a week of fun, family and laughter as we share what makes this part of Italy so special in a very personal way, amidst one of the most gorgeous backdrops in the world! The Amalfi Coast has its share of villas, but there are very few that offer central location, stunning views, private rooms with en-suite bathrooms, walking distance to town, an infinity swimming pool and much more. Villa Eremo San Francesco is one of just a handful that has it all... ...and it is ALL OURS this week! We'll have three half-day completely hands-on cooking classes this week, plus a unique "family cooking experience". 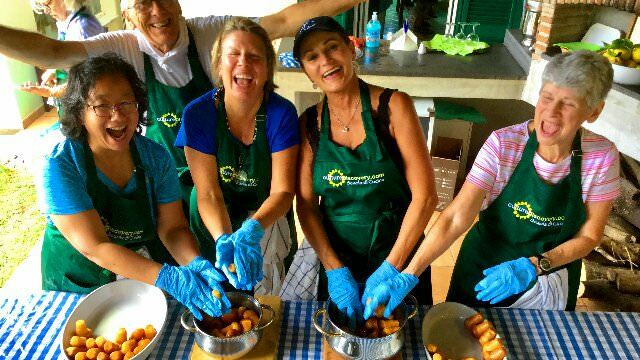 Our cooking classes are not demonstrations. They are 100% hands-on. We structure them so that you can be as involved as you wish in every stage of every course we prepare. With every class, we roll up our sleeves and get wrist deep in making everything fresh, from scratch. During the week, we will be making three kinds of pasta from scratch, two locally-known recipes, 'Ndunderi and Bocconotto. 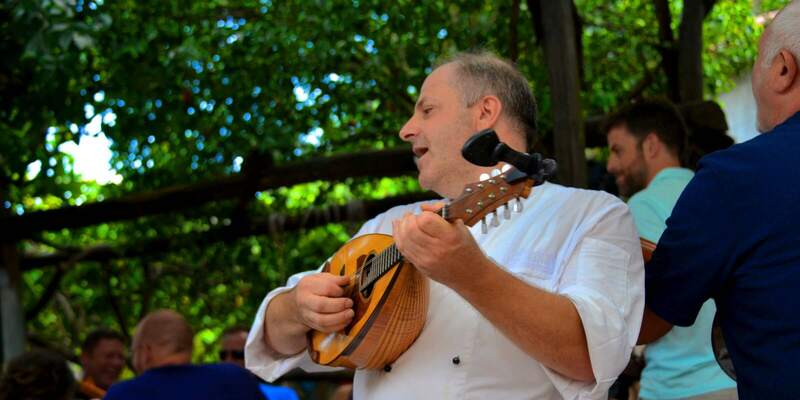 Traditional Neapolitan style Pizza, Caponata, Pasta Fazul, Fresh Mozzarella, stuffed and rolled eggplant, and local desserts like Baba' al Rum and much more!. 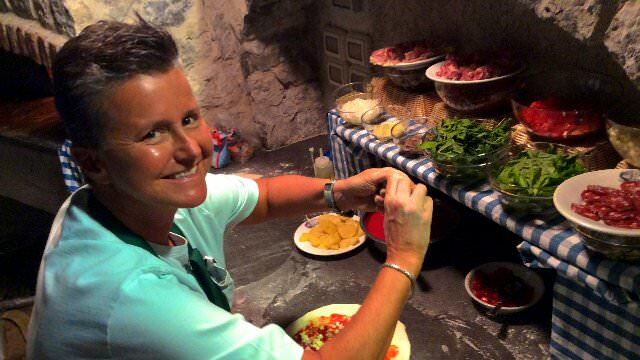 For those would rather eat than cook, you are at one of the most coveted spots on the Amalfi Coast. Read a book relaxing by the pool. Enjoy taking it all in, or head into town for shopping, or a stroll on the beach. Boredom is never a problem as there's always something to do...Or nothing at all! 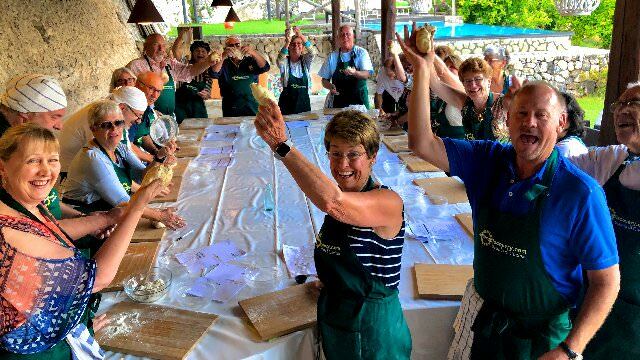 Whether we are cooking or on an outing, our all inclusive weeks always feature a full itinerary of lots of things to do. The vacation also gives you the opportunity to opt-in or opt-out of just about everything. So, if you feel like hanging out by the pool, soaking up the rays along with that awe-inspiring view, then that is exactly what you should do! Most rarely opt out of the excursions, because they are pretty amazing and unique! We'll be visiting Positano, Amalfi, Ravello, Minori, Tramonti, A Day on the water to visit the Island of Capri, and an outing to Pompeii. Moreover, they are not mere sightseeing trips, but they are truly a cultural discovery. 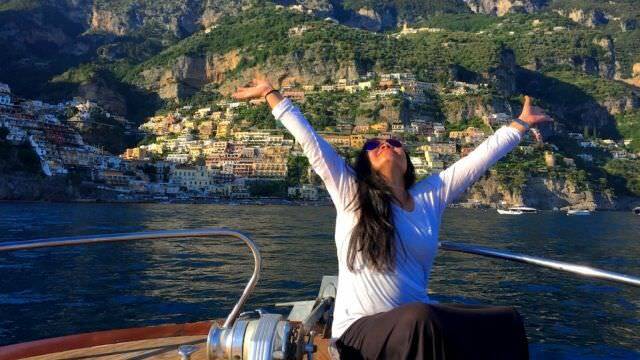 On the day we go to Positano, we go by private boat from the Amalfi harbor. We end our time in Positano with a private party on our private boats, before heading to a tiny cove for tonight's dinner. We'll have a memorable meal at a local family-run restaurant serving delicious regional fare from their family recipes. On the day we go to Tramonti, we visit a family-run winery and vineyard with vines as old as 500+ years, then join the family for lunch. While in Minori, we make Limoncello with Carletto, owner of a small Limoncello factory. The list goes on, and these are all experiences we trust you will never forget. We are all about food & wine, and if there is one comment we hear more than any other from our guests throughout the week, it is "I can't eat another bite". It's highly doubtful you will ever be hungry during one of our vacations. Not to mention that you will never want for more wine, period. All of the restaurant meals are in small, local restaurants that are considered to be among the best of the best for their area. These are the places the locals rave about, and are not geared to accommodate mass amounts of tourists. Furthermore, we don't do "special-menu-tourist food". We insist on the highest quality everywhere we go. The wine is always flowing at lunch and dinner. We always focus on local wines from the area we are in, and it is always fantastic! 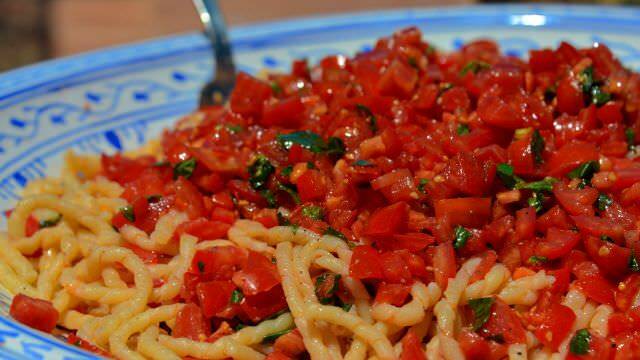 Being on the Amalfi Coast affords us the opportunity to have the freshest, locally-sourced products available. There is nothing more Italian than having seasonal, local specialties that you can not find...nor taste the freshness of, anywhere else in the world! 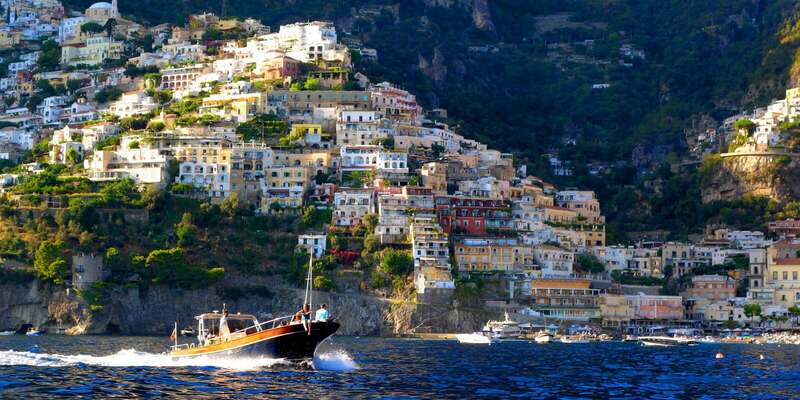 Along the Amalfi Coast, we will visit the villages of Positano, Amalfi, Minori and Conca dei Marini. 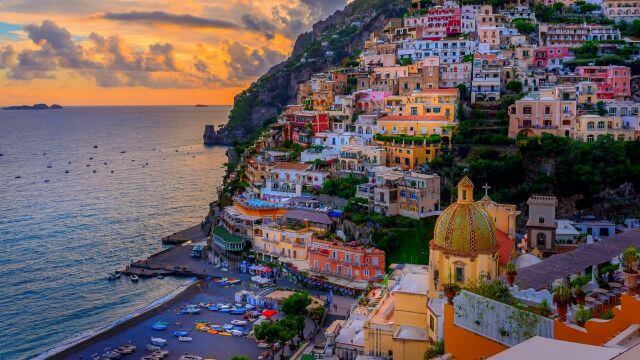 We will be arriving by boat to visit the coastal town of Positano, where we have plenty of time to wander the alley-ways and narrow streets that wind their way up to beautiful panoramas of the town below and the dramatic coastline. On the way back we will stop at the Conca dei Marina for dinner. The town of Amalfi reminds us of its storied past as a wealthy Maritime Republic. And, Minori, where coastal living is truly still treasured by the locals. Your vacation week also takes you off the coast for some of our outings. We'll be visiting The Ruins of Pompeii, which is one of the most important archeological sites in the world. 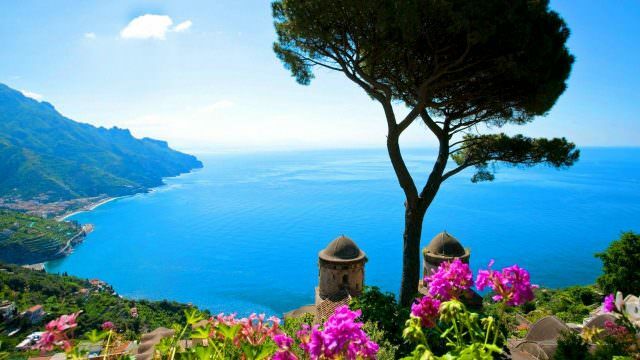 Ravello, the beautiful hilltop hide-away that was once home to emperors and nobility. Also, Tramonti, where we will see 500 year old grapevines that they still make wine from, as well as being treated to an amazing wine tasting and lunch. 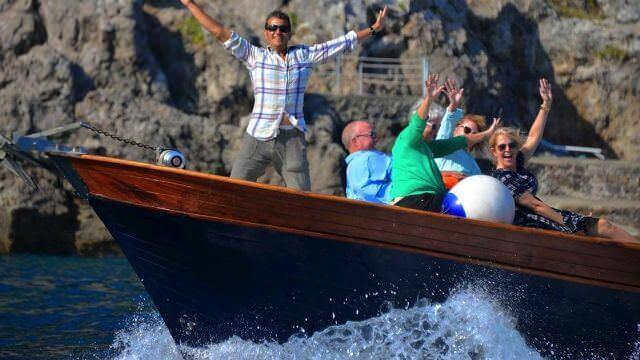 Besides Positano, we also take private boats to the island of Capri. This island is as picturesque as it is remarkable. We'll cruise the famous grottoes around the island, including the Blue Grotto as well as many others. 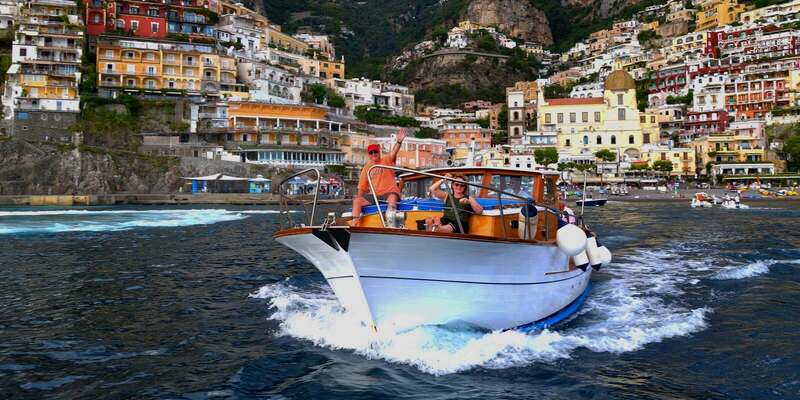 We'll also have an on-island experience and visit the towns of Capri and Anacapri. Both of which are unique in their own way and offer tremendous ocean views amid the shops, cafe's and meandering alleyways. 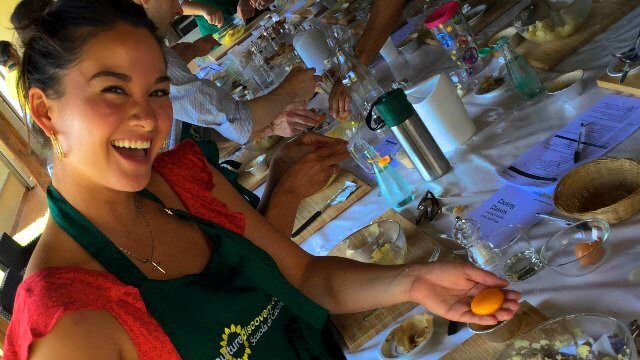 Two Full-Course Classes, Limoncello Experience plus Pizza Class! 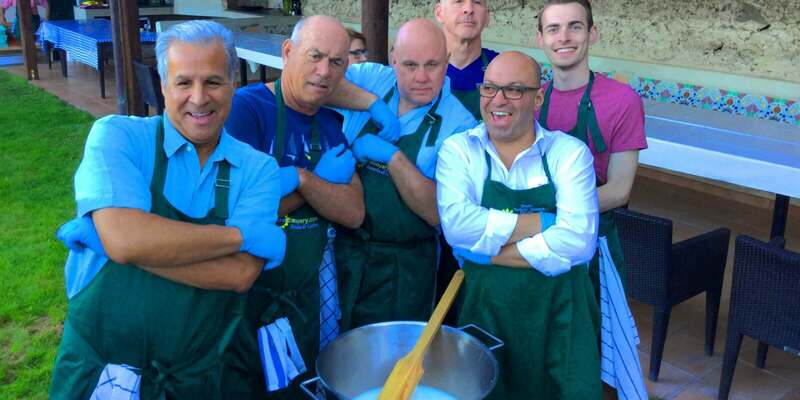 Grab an apron! 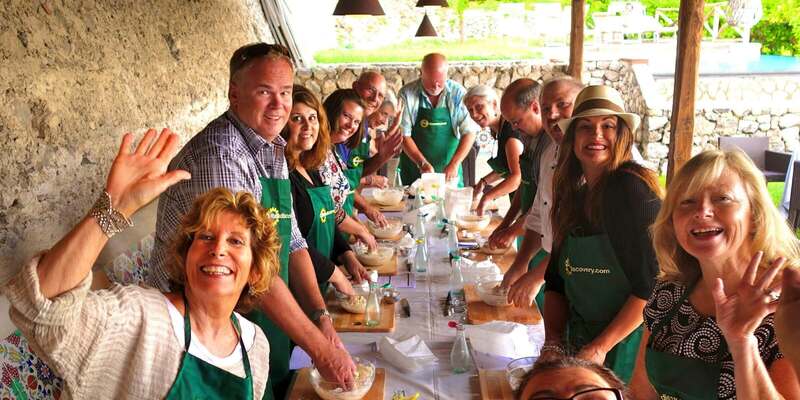 It's time to start cooking...Amalfi-Style! Everyone gets into the act during our first cooking class. This is where the guests really start to get to know each other, having so much fun, singing, dancing, drinking wine, cooking and enjoying some great food for our lunch! 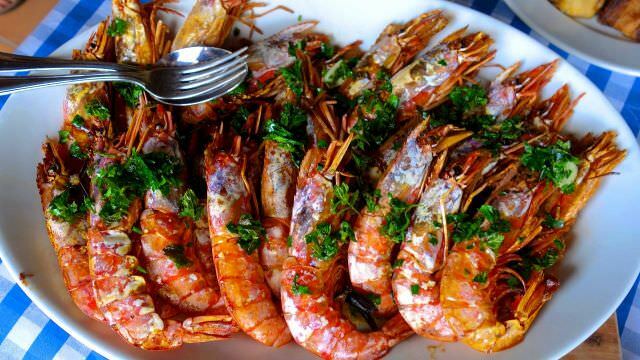 More amazing dishes we'll be making in class at the villa...Overlooking the sea! Our second class of the week promises to be another fun-filled morning making another fantastic lunch! 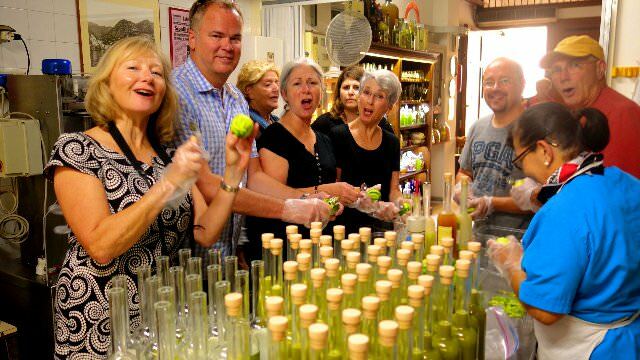 Class # 3 We're making Limoncello with one of the area's premier limoncello producers. We leave for Minori in the morning and mingle with the locals at the farmer's market that comes to town every Thursday. We'll pick up our fresh ingredients for tonight's pizza night from the local produce vendors. We'll then head over to make Limoncello with Carlo Mansi. We'll use his specially-picked lemons and learn exactly how to make this local specialty liquore. For our final class, we're making Napolitano Pizza! We make traditional Napolitano-style pizza from scratch. We'll be making the dough, rolling it out and putting on our own selection of toppings before it goes into the wood-fired brick oven to bake to perfection. Pizza night at the villa has become such a Culture Discovery tradition and is always a very special evening with family and friends.